This substrate produces a brown chromogen precipitant in the presence of peroxidase enzyme. 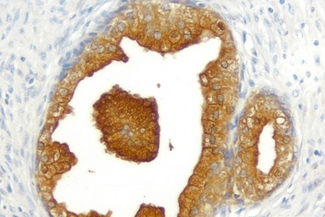 Suitable for brightfield visualization in IHC, ICC, and ISH, as well as various blotting applications. Sufficient to produce 120 ml of working solution. ImmPACT™ substrate has 2 to 4 times greater sensitivity than the original. Features: - 2 to 4 times greater sensitivity than original substrate kit - Brown chromogen precipitant - Precipitated by Peroxidase - Suitable for aqueous (hardening) and non-aqueous (permanent) mounting - Sufficient reagents to produce 120 ml of working solution - For Brightfield, Darkfield, Electron, Spectral Imaging - Greater sensitivity than conventional substrates - Suitable for IHC, ICC, ISH, Blotting Applications, and Elispot - Suitable for use in single or multiple labeling assays - Heat Stable - Consistent and reliable - Stock solutions supplied in convenient dropper bottles promoting ease of handling - Working solution stable for up to 14 days at 4 °C - One year expiry date Applications: - Immunohistochemistry - Immunocytochemistry - In situ hybridization - Blotting Applications - Elispot Details: DAB (3, 3 -diaminobenzidine) HRP substrate produces a dark brown reaction product and can be used for both immunohistochemical and blotting applications. 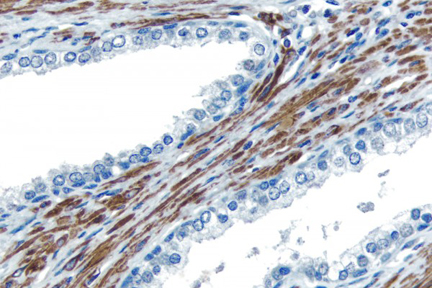 DAB chromogen is effective as a single label or as a second color for multiple antigen labeling. Because of its heat-resistance, DAB can be used in IHC/ ISH double labeling applications. With the aid of imaging systems and software, the spectral profile of DAB can be distinguished from our other proprietary enzyme substrates in applications where antigens are co-localized. 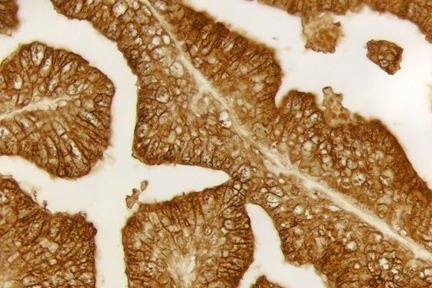 Sections stained with DAB can also be viewed by darkfield and electron microscopy. Slides developed with DAB can be dehydrated, cleared, and permanently mounted. The DAB reaction product can be intensified with DAB Enhancing Solution (LS-J1039) This product is an entirely new formula for a diaminobenzidine based peroxidase substrate. ImmPACT™ DAB produces a dark brown reaction product that is crisper and is 3-4 times more sensitive than the original Vector® DAB substrate kit. 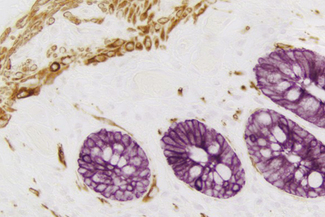 It can be used for both manual and automated staining methods. 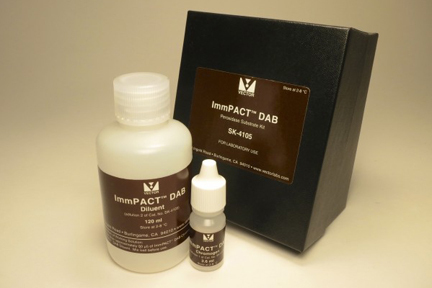 The ImmPACT™ DAB working solution is stable for at least five days at room temperature and at least two weeks when stored at 4° C. This product consists of 120 ml of diluent and a convenient concentrated stock solution of highly purified DAB. This product can also be used on blots. 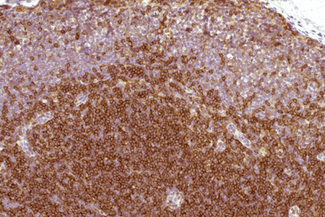 Tonsil: Cytokeratin (m), ImmPRESS™ Anti-Mouse Ig Kit, ImmPACT™ DAB (brown) substrate. 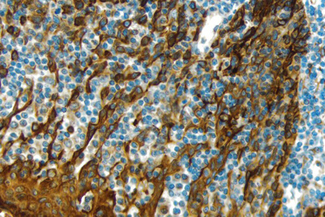 Hematoxylin (blue) counterstain. Prostate: Prostate Specific Antigen (p), ImmPRESS™ Anti-Goat Ig Kit, ImmPACT™ DAB (brown), substrate. Hematoxylin QS counterstain. Prostate: Prostate Specific Antigen (m), ImmPRESS™ Reagent (HRP), ImmPACT™ DAB (brown). 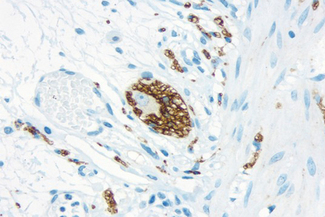 Prostate: Desmin (m), VECTASTAIN® Universal Quick Kit, ImmPACT™ DAB (brown) substrate. 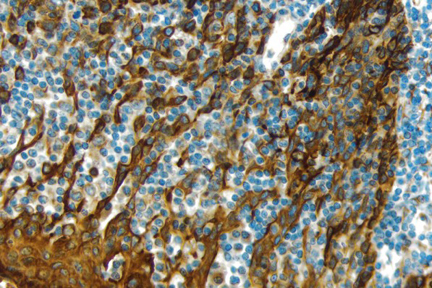 Hematoxylin QS (blue) counterstain.